Hungary is due to hold elections in spring 2014. Erin Marie Saltman writes on the current state of play ahead of the elections, where the ruling Fidesz party will be seeking to maintain control over the country’s government. She notes that recent polls put Fidesz comfortably ahead of its nearest rivals, and that the fragmented nature of the opposition within Hungary is likely to undermine any attempt to seriously challenge Fidesz for power. The upcoming Hungarian national elections in spring 2014 will take place in a context which is indicative of a wider European crisis of cultural and value-based politics. Hungary’s deeply polarised political spectrum has produced a weakened myriad of liberal-left parties, struggling to counter the united stronghold of the conservative nationalist party, Fidesz, who continue to lead a nationalist discourse. This article outlines the political landscape in Hungary and the potential political options and outcomes in the fast approaching elections. In the last national elections in 2010, Fidesz won a landslide victory in the midst of a fallen opposition. A once strong bipolar political landscape between the left-wing MSZP and right-wing Fidesz became a unipolar swing to the right after MSZP struggled to recover from political scandals in 2006. Subsequently, Fidesz won a two-thirds parliamentary majority. The 2010 disjuncture in party politics also gave way to the Green party LMP (Politics Can Be Different), and young radical right party, Jobbik, entering parliament for the first time. While LMP passed the electoral threshold, winning 7.5 per cent, Jobbik became the third largest parliamentary party, gaining 16.7 per cent. The Table below illustrates these results. Since the elections, the Fidesz government has overhauled existing legislation in several areas. The 2010 New Media Laws were the first government initiatives to bring about concerns from the international community, questioning freedom of speech and the press in Hungary. At the heart of Hungarian restructuring was the new Hungarian constitution, which instigated a second wave of domestic and international concern from European bodies, the United States and international NGOs such as Freedom House and Amnesty International. The adoption of the new Constitution in 2011 was itself controversial, with many critics claiming there was insufficient input from opposition groups or civil society. The content of the constitution was also judged to be reflective of Fidesz principles, rooted in nationalist Christian ideologies, and politicising previously independent institutions. The largest points of contention have been changes made to the judicial system (creating a centralised judicial authority), the inclusion of many value-based regulations within the constitution (e.g. redefining the basis for state-recognised religious institutions) and certain social policies (such as making homelessness illegal or defining marriage and family along conservative Christian lines). The Fidesz government has also been scrutinised for making a two-thirds majority vote necessary to change or repeal new legislation, amendments and policies. Taking these concerns into consideration, the Fidesz government has to date amended the 2011 Constitution five times in attempts to appease the international community, though many critics remain. Fidesz maintains that the constitution and other policies have been lawfully enshrined and in accordance with the popular national will. While Fidesz stands strong with a steadfast support base, opposition parties have become increasingly fragmented. Along with the Hungarian Socialist Party (MSZP), numerous first-time political parties will be competing in the 2014 elections. Having broken off from MSZP in 2010, ex-Prime Minister Ferenc Gyurcsány is leading the new left-wing Democratic Coalition Party (DK). Previously a fringe social movement, the youth-based liberal party Fourth Republic (4K!) has also appeared on the political scene in alliance with LMP. Recognising the need to unite electorally, the two anti-government opposition social movements (Milla and Szolidaritás) combined forces in 2012 with the former interim Prime Minister Gordon Bajnai, introducing the Together 2014 party (Együtt 2014 – E14). While there was an initial hope that this movement could concentrate liberal-left political forces against Fidesz, the results have been underwhelming. Opposition parties seem unable or unwilling to find common ground in making alliances. While DK was an original hub of support for the Together 2014 opposition alliance, negotiations now seem to have broken down due to longstanding disagreements between DK and MSZP leaders. The marginalised Green party LMP has also declined a larger alliance, refusing to work with any parties associated with the communist past (i.e. MSZP). LMP’s decision to decline to work with Together 2014 also led to a split within the Green party, resulting in yet another splinter party, Dialogue for Hungary (PM), formed in February 2013. PM has subsequently formed an official alliance with Together 2014, now labelled as E14-PM. Meanwhile the only mainstream party currently on board with Gordon Bajnai’s alliance is MSZP, although this relationship has been fraught with confusion over how candidates and party names will appear on the ballot. All the parties continue to hold rallies, some together and others separately. The Together 2014 alliance is currently anything but together, and voter scepticism and confusion continue. The most recent national polls show very little change in voter trends in the past few months. The proportion of undecided voters remains relatively high (between 29 per cent and 34 per cent) with some polls estimating even higher numbers. Among decided voters, Fidesz remains unchallenged, with 48 per cent. 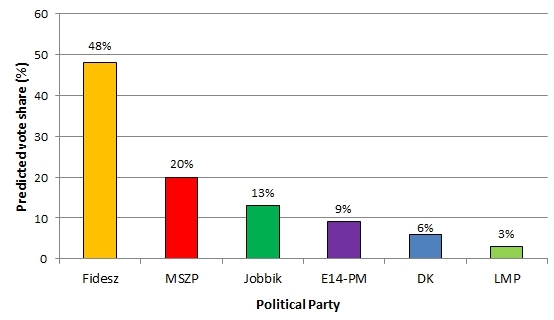 Among the opposition, MSZP has 20 per cent and the E14-PM alliance has 9 per cent, while Jobbik maintains support of 13 per cent. Meanwhile, the rest fall dangerously close to not passing the 5 per cent electoral threshold. The 4K! party is not even listed in the polling statistics due to its lack of popular support. The Chart below shows the results for decided voters in a recent poll. The reason behind Fidesz’s unrelenting strength is in part the continued confusion of opposition parties splintering, making and breaking alliances. However, Fidesz also appeals to Hungarians who feel subsumed by the supranational force that is the EU. Euroscepticism is high in Hungary and the Fidesz government continues to centralise national assets such as banks and utilities companies away from foreign control. Studies conducted in 2013 by the Republikon Institute found that, while the EU-27 average for positive sentiments towards EU membership was 56.5 per cent, this sentiment was only shared by 36.4 per cent of Hungarians. A similarly low percentage of Hungarians feel that Hungary has benefited from EU membership. While western EU countries often cultivate Euroscepticism out of economic, market-oriented concerns, in Hungary, and across Central and Eastern Europe, Euroscepticism is a political tool of the right and radical right. Although Prime Minister Viktor Orbán says that Hungarians are Eurorealist, rather than Eurosceptic, he has also likened Brussels to oppressive forces from Hungary’s past. The strengthened radical right has also impacted civil discourse. Jobbik has taken the scapegoat narrative further by bringing anti-Semitism and anti-Roma discourse into the mainstream. Terms like ‘gypsy criminality’ have become a buzzword in mainstream media in recent years, alluding to the supposed genetic traits of criminality apparent in Roma populations. Anti-Semitism has also exerted pressure on the Jewish communities in Hungary, to the point that prize-winning Hungarian author Ákos Kertész was recently granted political asylum in Canada after continued harassment and death threats following the publication of an article critiquing the current socio-political state in Hungary. Along with new parties competing in the 2014 national elections, the Fidesz government has also established new electoral structures. According to the 2011 electoral reform law, from 2014 onwards the number of members in the National Assembly will drop from 386 to 199. Partly because of the reduction in the number of constituencies from 176 to 106, the law will also bring in changes to certain constituency boundaries. There will also be only one round of elections, replacing the previous two round system. These changes have been justified on the grounds of simplifying the electoral process for voters, as well as decreasing the number of parliamentary representatives to a level similar to other countries of comparable size to Hungary. However, the opposition has raised concerns that current changes are purely Fidesz gerrymandering to ensure a continued majority in the next elections. What does all of this mean in terms of the 2014 national elections? As it stands, no party has the organisational strength or popular support to pose a real challenge to Fidesz. Opposition parties have failed to fully unite in the face of adversity, largely due to their inability to put common goals ahead of party politics. Meanwhile, Fidesz has maintained its unwavering long-time alliance with the Christian Democrats (KDNP). It has shown a tremendous amount of force and action in the last three years (regardless of its critics) and it shows no sign of internal party conflict. The main question will be whether or not Fidesz is able to maintain the two-thirds majority that has allowed it to make so many changes to the national political system. Erin Marie Saltman is a PhD candidate in the School of Slavonic and East European Studies at University College London. Her doctoral research focuses on the process of contemporary political socialisation in Hungary, looking at youth activism and party alignment in a post-communist setting. Her research interests and expertise include civil activism, cross-European subterranean political movements and electoral memory studies. The facts that Fidesz has won nearly all the 200+ by-elections held (at both parliamentary and local council levels) since 2010 and the big lead they have according to all pollsters back up quite convincingly that “the constitution and other policies have been lawfully enshrined and in accordance with the popular national will”, don’t they? Ah, for some reason you “forgot” to tell that “critique of the current socio-political state in Hungary” was that “Hungarians are genetically subservient” and Kertész likened Hungarians to “wallowing pigs”. I suspect that every day Hungarian people probably would see things differently if they had better access to all the facts on their country, as is with member states in the EU, the top end government party should better educate the population rather than subdue and push them around, the government should learn with the population that freedom is a human right and leads to betterment.